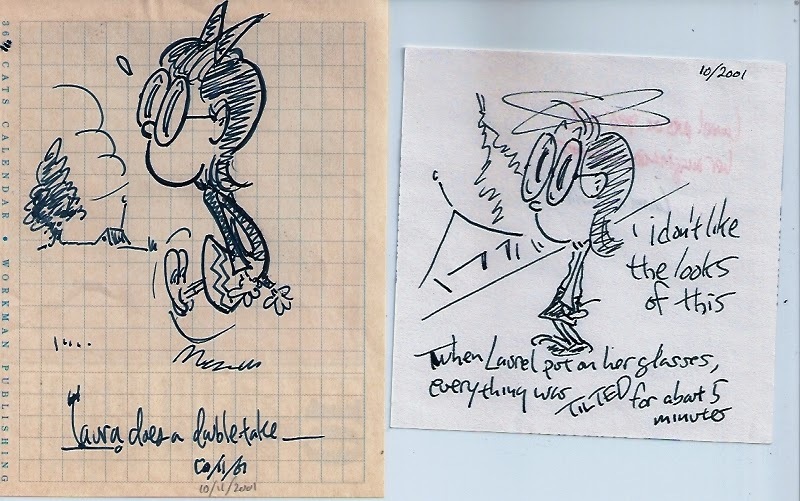 Just found these two sketches, drawn in October 2001, about six months before LAUREL debuted in print. My niece Laura Grace was about to get her first set of glasses, which inspired the sketch at left. A story idea about a little girl first getting glasses came to mind. To give Laura's sister Rachel Souza equal billing, the name became "Laurel" by the second sketch, drawn shortly after. That story hasn't come about, but Laurel herself did the rest! Thanks, Laura and Rachel--couldn't have done it without you!